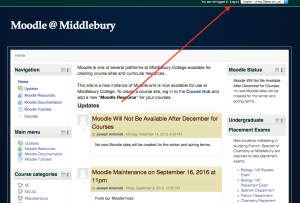 Middlebury’s Moodle instance is redirecting to https://moodle.middlebury.edu. Please note that the archive is only accessible to Middlebury faculty, staff, and students who are accessing the site while on a Middlebury network, or via Middlebury VPN. You will know that the login attempt worked when you are directed to Moodle. To enter the site click the “Login” link which will re-direct to the MIddlebury login page. In testing, a dropdown menu came up a second time for some when attempting to login to Moodle as described below. Login once more with your Middlebury username and password. The archive will not be accessible to Middlebury self-registered guest accounts. The archive will be maintained until December 2018* when it is expected to be de-commissioned. *December 2018 will mark the end of the two-year online course material retention policy since the adoption of Canvas in the Fall 2016 term. Active faculty, staff, and students can access the Moodle archives via Moodle links from the Course Hub. Clicking on a link to a past Moodle resource in Course Hub will prompt the login process described above. We will continue to support faculty who plan to import archived course content from the Moodle archive to Canvas. * You may use the existing instructions to migrate your course sites, or you may request assistance. *Some Moodle course archives are very large (greater than 1GB) due to repeated imports and remixing over the years. If your back-up is noticeably large, we may request that you be more selective with items included in the import file to reduce the file size import to Canvas. We may also make recommendations about ways to more distributively host file types (e.g. video and audio) that tend to take up greater amounts of server space. Moodle currently hosts course content dating back to Fall 2010 term. After December 2018, Moodle will be de-commissioned. If you would like to create a back-up of your Moodle formatted content for personal storage, we recommend following the course back-up process outlined by Moodle.org. The process will produce an .mbz formatted file. This file format can be imported into Canvas or re-imported into another instance of Moodle* which could be accomplished by installing a copy of Moodle on a personal MiddCreate site. Alternatively, an .mbz file can be renamed to .zip format for limited file access, or storing on a cloud file storage account like Google Drive or Microsoft 365 OneDrive. *Please note that Moodle is frozen at version of Moodle 2.8.8 while the most recent stable version of Moodle is 3.3.1 (as of July 2017). This means that archive content may not be fully compatible with newer versions of Moodle. This entry was posted in ITS, Library, LIS Staff Interest, Middlebury Community Interest, Post for MiddPoints on August 2, 2017 by Joseph Antonioli.